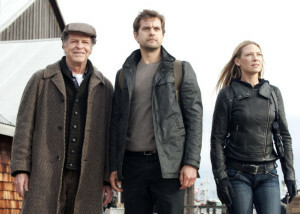 Summary: Even with a shortened season, Fringe still churns out a signature “weird acid trip” of an episode, quite literally this time. There’s no way this wouldn’t have succeeded…if that were the entire episode. Astrid is awakened by the radio found in the pocket universe, which is finally broadcasting a signal. Walter, however, has dropped acid, and thus isn’t much help with deciphering it. He sees visions of green fairies, his lab assistant Carla Warren (from “Peter”) and Nina from 1985, who pull him back and forth between being the Walter he once was or fighting against him. The gang gets Anil to track the signal to Connecticut. However, they only discover dead bodies; it was just a relay tower, which Olivia realizes was being protected by Sam Weiss, who died protecting it. Meanwhile, Carla’s apparition guides Walter to a hidden compartment with the life’s work she apparently tried to burn the night she was killed. He hallucinates going to the Observer base in Manhattan, only to realize the gang has taken him to get a boat after tracking the signal to its origin point on an island. They are stopped by Loyalists, but they fight them off and make it to the island. They find a house where the signal is coming from; a man emerges with a rifle and tells them to leave. The Observer boy emerges as well, and the team realizes they’re at the right place. However, the man refuses to put down the rifle unless they give the password, which the team doesn’t have. 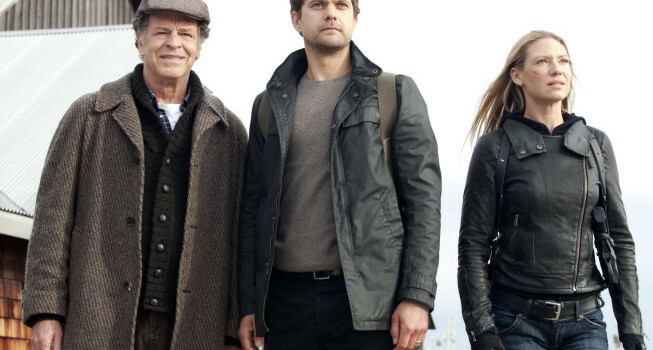 Fringe fans taking the time to read reviews are probably already aware of the “weird 19th episode” tradition the show started back in season 2. “Brown Betty” was a silly, but insightful, musical escapade derived from Walter’s stoned psyche; ”Lysergic Acid Diethylamide” used its cell-shaded animated sequence within Olivia’s mind to tie up a major story arc; and “Letters of Transit” took a step away from the drug references to create a then out-of-the-blue, other-worldly story that turned out to basically be the final season premiere. “Black Blotter” comes in four episodes before the finale instead of the usual three, but still fits in with the tradition. It ties closer back to the first outing; in addition to it being named after the drug’s nickname like “Brown Betty,” it’s also another powerful, colorful character piece about Walter through the eyes of his profoundly broken psyche. Both episodes contrast silly playfulness and comedy with incredibly dark undertones and revelations about Walter himself. “Black Blotter” is even darker than “Brown Betty” at the end; season 2’s outing had little Ella convincing Walter that you can, theoretically, write your own happy ending, while season 5’s ends with Walter trying to take hold of his own destiny and apparently losing. “You’ve been him longer than you’ve been you,” which Carla utters throughout, nails in the futility of Walter’s attempts to stop his darker half. As much as I miss Blair Brown these days, it’s actually quite effective that she has so little screentime as the Angel on Walter’s shoulder. Devil-on-his-shoulder Carla, who represents the death and horror he feels most guilty for, basically guides him around throughout the entire episode. Nina, on the other hand, represents the few good things that have come from his mistakes (Peter and Olivia, Nina turning out okay herself) but only pops in occasionally. When she does appear, the way the scenes are shot and edited feel disconnected, as if Nina’s only present to say a few words and then disappears instead of hanging around like Carla does. Many times we’ll only see Nina in a quick close-up, and as soon as we return to a wider shot, she’s gone. It’s a bit disorienting to watch, but it’s also an acid trip, so it’s to be expected. The fact that this reassuring side of Walter appears so sparingly is sad, but completely in-character with how little Walter thinks of himself. Even with his determination to take down his own dark side, his lack of confidence and supreme guilt are still too strong to overpower it. Tommy Gormley’s direction, and the cinematography as a whole, is well-utilized and creative throughout Walter’s experiences. The foggy, rainbow-making filter from the candle is beautiful, and clever transitions like Walter watching Anil and the gang on the television, are quite fun. The multiple images interspersed from season 2’s “Peter,” which arguably remains to be Fringe’s finest hour, does well to direct Walter’s guilt. The frozen image of Nina losing her hand, and especially the beautiful projections of those scenes between the Bishops, bring back memories of that masterpiece of an episode and uses them in the best way. Sure, we didn’t necessarily need to see nearly two full minutes of those clips, but they were good enough scenes that they were worth seeing again. And even at that, it still played into the strange pacing that made up Walter’s dream sequences. Is there really anything that can be said about the Monty Python-esque animated sequence? It was completely out of nowhere, and the pure surprise at such ridiculousness was a fantastic jolt of energy. The animation itself perfectly emulated the classic Monty Python sequences—right down to the aged look and the stomping foot gag—and, as a whole, was much more well-done and fun to watch than the extended animated sequence in “Lysergic Acid Diethylamide.” The classical music in the sequence was spot on, and in fact the wide range of rock classics used to score Walter’s trip all added to the general, drugged-out aura his scenes were going for. However, and this may seem odd to say, but a major hindrance to the episode’s success is actually that there wasn’t enough weirdness. Similar to the problem that “Through the Looking Glass (and What Walter Found There)” had, the show seemed afraid to plunge full-on into the weirder possibilities for the sake of keeping the normal plotlines going, and hurt the pace as a result. While it’s good that the plot hasn’t suffered for the sake of pure ambition, in this case anything not-Walter related was downright boring and uninteresting. There wasn’t enough time to properly focus on the aftermath of Peter’s Observer stint, or any of the reveals about Donald and Sam Weiss (we miss you, Kevin Corrigan! ), but there was still too much time spent on those aspects to keep things engaging. We just closed off a major story arc last week, so it would be fine to take a break from it before addressing it, but it should have kept focus completely away rather than tease us with some throwaway lines that don’t add much substance. It also makes it more evident how the pointless the conclusion of Peter’s arc felt at the end of “The Human Kind,” since things are pretty much back to normal (or however normal it gets) without much consequence. “Black Blotter” as a whole isn’t as wildly entertaining as “Brown Betty” or as stunningly ambitious as “Letters of Transit.” But Walter’s extensive hallucinations, in terms of both creativity and the representation of Walter’s character as a whole, are spot-on and entertaining; it would have just worked a bit better if the entire episode had the energy and creativity of those sequences. On the upside, with the Observer boy in the team’s hands and the revelation that he has knowledge of both timelines, the less-weird plots of next week should be interesting, at the very least. Both of Blair Brown’s season 5 appearances require her to be in make-up to look either 20 years older or 20 years younger. Girl can’t catch a break. 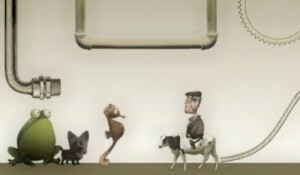 The frog and seahorse in Walter’s hallucination could both be references to the glyphs, but is the dog a reference to anything? We finally got a Gene appearance this season! Well, sort of. I still wish we’d find her alive and encased in amber. Does this season have to fill a “fight sequence” quota? Because that Loyalist gunfight was the most pointless one yet. The Observer boy’s name is now “Michael.” There’s no way that’s not a reference to Michael Cerveris. Hearing Olivia say “I had a daughter” in any context is striking and painful. Much as I like getting closure for such an enigmatic character as Sam Weiss, it seemed like the show was trying too hard to squash any (admittedly valid) theories that Sam is Donald. Which makes me wonder if Sam is Donald, somehow. Or maybe his son, since “The Last Sam Weiss” established that this is supposed to be a big legacy. No reason why Sam couldn’t have hooked up with someone in this timeline. All this build-up and mystery about Donald better lead to something more satisfying than “he’s just some good guy who’s dead now,” by the way. I didn’t get as far on my personal Fringe rewatch as usual this week…and yet, like the last two episodes, I still ended on an episode with a connection to this one: season 3’s other weird LSD episode, “Lysergic Acid Diethylamide,” my least favorite of the four weird outings.